This article's purpose is to ensure statewide consistency in the transportation improvement programming process and assist MoDOT employees in fulfilling the requirements for programming transportation projects. Each Missouri Metropolitan Planning Organization (MPO) must develop a Transportation Improvement Program (TIP) for their respective metropolitan planning area (MPA) in cooperation with MoDOT and public transit operators. In the three bi-state MPOs in Missouri, the TIP is also developed in cooperation with neighboring state DOTs and public transit operators. A TIP is a four- to five-year priority list of transportation projects to be built in an MPA. Once a TIP is approved by an MPO, the governor, the Federal Transit Administration (FTA) and the Federal Highway Administration (FHWA) (the last two together are known as OneDOT), it is included without change in the STIP, directly or by reference. An MPO is the transportation policy making entity for the MPA, which develops and administers the TIP. In addition to federally funded transportation projects, the TIP may include a listing of all other transportation projects that utilize state and/or local funding sources. The TIP must be consistent with the Metropolitan Transportation Plan (MTP), otherwise known as the Metropolitan Long-Range Transportation Plan (LRTP), and meet clean air, civil rights and environmental justice requirements. In order for surface transportation projects to receive federal funds from FHWA and FTA they must be included in the TIP. 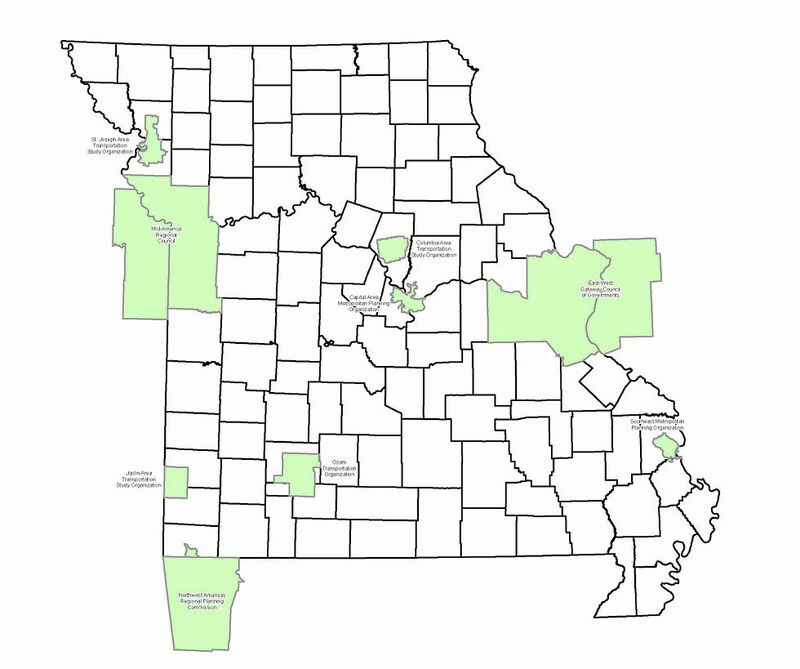 Missouri has eight MPOs, three designated as Transportation Management Areas (TMA) or “large” MPOs and five of which are referred to as “small” MPOs. In 1962, the United States Congress passed legislation that required the formation of an MPO for any urbanized area (UZA) with a population greater than 50,000. MPOs were then differentiated as small or large based on whether they fell below or above the 200,000 population threshold. The Missouri State Transportation Improvement Program (STIP) is updated on an annual basis. A STIP can remain in place for up to four years. Because of this cycle, the STIP's approval should never expire. Likewise, all TIPs in Missouri are updated at least every two years. A TIP, like the STIP, can remain in effect for four years. In Missouri, a TIP is incorporated into the STIP when approved by OneDOT. Any project listed in the TIP is included in the STIP by reference. This doesn’t, however, exempt those projects from the requirement that the Missouri Highways and Transportation Commission (MHTC) approve their inclusion in MoDOT’s Right of Way and Construction Program. A TIP must include all road, bridge and transit projects within the MPA that are funded by Title 23 and Title 49. A TIP may include any transportation project in the region. It is the MPO’s decision what to include in the TIP, outside of what federal regulations require. MoDOT provides the MPOs with information regarding state funded projects for inclusion in the TIP. The federal regulations don’t require this; however, it allows the MPO to show a more complete picture of all the transportation improvements in the region. In its most basic form, the TIP is a listing of the transportation related projects for a given metropolitan area. The addition of thru traffic lanes of one mile or more on roads that are functionally classified as arterial or higher. New or converted grade separated interchanges on arterial roads that are functionally classified as arterial or higher. Each MPO defines what constitutes a regionally significant project within their respective MPA. The respective MPO should be consulted with to determine whether a given project is considered regionally significant or not. In nonattainment or maintenance areas, regionally significant projects must also be included in the Transportation Conformity Determination. Transportation Conformity is a federal requirement in nonattainment areas to conduct air quality analyses on projects, programs and policies, identified in MTPs and TIPs, to ensure the collective investments fit within the air quality budget allotted to mobile sources in the State Implementation Plan (SIP). A SIP is a state plan for complying with the Federal Clean Air Act and its Amendments (CAA). The SIP consists of narrative, rules, technical documentation, and agreements that an individual state will use to clean up polluted areas. 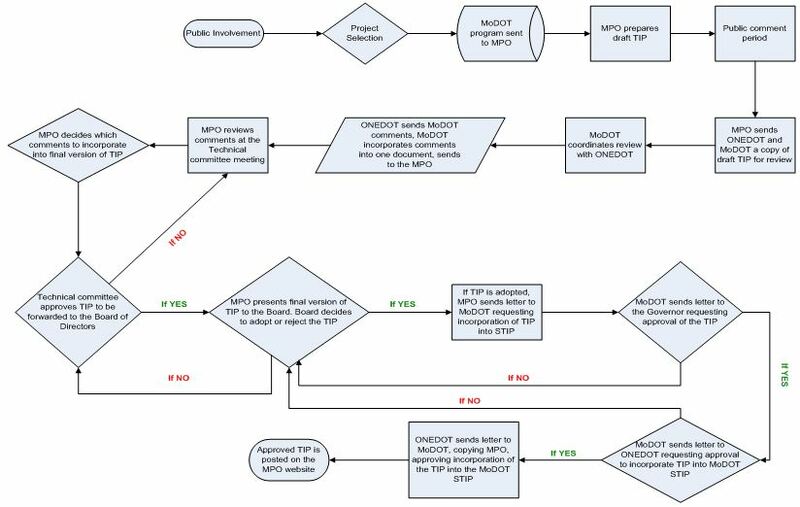 The policy board of an MPO must formally make a conformity determination on its MTPs and TIPs prior to submitting them to OneDOT for an independent review and conformity determination. The purpose of a conformity determination is to ensure that federal funds spent on transportation are not adversely impacting the federal funds spent to clean up the environment. It is important to note that the project information contained in the TIP should reflect, to the extent practical, the information contained in the STIP. If there is a discrepancy, MoDOT staff should coordinate with the MPO to determine the reason for the discrepancy and to decide which document should be changed. The appropriate document should be corrected at the TIP update or STIP update unless an upcoming federal approval action requires more timely action, in which case, an amendment or administrative modification is needed. The obligation of federal funds prior to advertising for a letting is the most common need for an amendment. Other OneDOT actions might include an approval of an environmental document, any other obligation request approval, a right of way acquisition approval or an award concurrence. A given project must be in the TIP prior to any of these actions. Total cost (past, present and future) for the project. Regulations require that TIPs show all costs of a project even if the costs are programmed outside of the TIP horizon. Identification of Transportation Control Measures (TCM) for Air Quality compliance and para-transit and light rail key station plans for Americans with Disabilities (ADA) compliance. Projects that are not considered to be of appropriate scale for individual identification in a given program year may be grouped by function, work type, and / or geographic area. Examples might include passenger rail / highway rail crossing safety projects, minor pavement rehabilitation projects or non-federal scoping projects. The projects included in the TIP must be consistent with the approved MTP. If the MTP doesn’t list specific projects then the project must be consistent with the goals and values of the region, as described in the plan. MoDOT provides the MPO with a listing of obligated projects from the prior year to be included in the current TIP. This documentation must be published within 90 days of the end of the program year and must be consistant with the MPO's Public Involvement Plan (PIP). MoDOT provides the MPO with the information for the annual listing of obligated projects. This information should be provided to the MPO within 30 days following the end of the MPO fiscal year to allow the MPO adequate time to complete the process. The annual listing of obligated projects should be included as part of the TIP document. However, if not feasible due to the timing of the federal fiscal year and the TIP fiscal year, the annual listing of obligated projects may be published separately. The annual listing of obligated projects indicates how much money was requested to be obligated during the previous year, how much money was obligated during the previous year, and how much money, if any, remains programmed. Along with the project requirements, the TIP must include a financial plan which provides a discussion of the costs incurred for the region and revenues available to the region to deliver projects and, at the same time, adequately provide for the maintenance of the Federal Aid system. The financial plan is a discussion of the revenues and resources reasonably available to the region to cover the costs of the transportation system. This includes costs to implement the program and costs to maintain the existing infrastructure. It is also a discussion of other needs outside the existing program and ways to finance those needs in the future. To summarize, the discussion should document that sufficient revenue is reasonably available to cover the total programmed costs of projects for the region and cover the cost to maintain the federal aid system within its boundary. MPOs, MoDOT and public transportation operators cooperatively develop estimates of funds that are reasonably expected to be available to fund projects. OneDOT currently requires that funding programmed in the TIP match the funding programmed in the STIP. From time to time, this requires updates to be made to a TIP or the STIP. Updates needed because of changes in funding levels can usually be done administratively. However, if the update consists of a major change in funding then an amendment is needed. As stated earlier, these changes should be made at the annual TIP update whenever possible. In developing the financial plan, the MPO must take into account all projects and programs and provide cost estimates for each. MoDOT and local public agencies provide cost estimates for their projects during the TIP development process. Revenue and cost estimates for the TIP must use an inflation rate to reflect “year of expenditure dollars”. This rate of growth is determined each year during the STIP development process. MPOs may use the same rate or choose another rate, whichever is appropriate. As with the project content, the financial content in the TIP should reflect the information in the STIP to the extent practical. Review - MoDOT and OneDOT will cooperatively review and provide comments to the MPO. This is to ensure federal regulations are being followed and also to ensure an efficient project delivery process. Comments consist of required changes and recommended changes. MoDOT review should take no more than 30 days to complete. Approval See the flowchart, below. Other reviews as deemed necessary by OneDOT. In nonattainment and maintenance areas, the MPO, as well as OneDOT will determine conformity of any updated or amended TIP. This is to document that money spent on transportation does not impact, adversely, efforts to clean up the environment. In Missouri, after OneDOT issues a conformity determination, the TIP is incorporated, without change, into the STIP, directly or by reference. MoDOT, the MPO, the Missouri Department of Natural Resources (MoDNR), the US Environmental Protection Agency and OneDOT coordinate through the inter-agency consultation process to address yearly conformity issues. The TIP will be made available to all interested parties consistent with the MPO’s Public Involvement Plan (PIP). This page was last modified on 15 February 2019, at 09:03.